Kaynemaile-Armour is used around the world for exterior screening — from large scale car parks to small retail store fronts. Now available exclusively through Danpal Australia, Kaynemaile-Armour uses premium quality polycarbonate. This makes it superior to traditional metal mesh in many. Kaynemaile-Armour mesh is super lightweight at 3kgs m2. It is only 15% the weight of the equivalent in stainless steel mesh; so it requires less supporting structure. Installation time and labour required can be cut significantly, reducing project costs. The Coco California retail store situated in Port Lincoln, Australia used Kaynemaile to give their existing low-key retail frontage a clean, modern look. The screen which enveloped the entire exterior facade took less than a day to install. A simple and effective way to add some upscale interest to an existing facade. Each individual Kaynemaile-Armour ring can hold up to 60kgs and the accumulated strength of the seamless mesh increases proportionately with the size of the panel. Kaynemaile have done a number of tensile strength and impact resistance tests. The Astron burst test had a point load area of approx. 32mm on small 140mm x 140mm sample and showed a peak resistance of 279kg. The material exceeds the required strength loads prescribed in AS/NZS 1170.1 for balustrades including C5 Crowd Loadings. 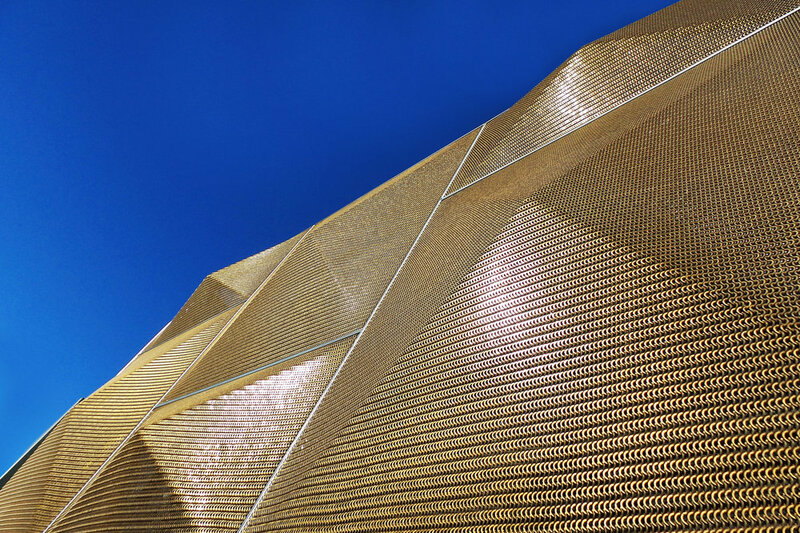 Kaynemaile-Armour keeps buildings cooler than traditional metal mesh products. Made from an engineering grade polycarbonate, it is extremely resilient and inherently insulating (with low thermal conductivity). Kaynemaile-Armour does not store heat in the way metal products do. It remains at near ambient temperature to protect the building from conductive heat gains. The three-dimensional mesh structure means more of the mesh surface area is in shade and a higher amount of ventilation is possible (when compared to conventional steel mesh products). 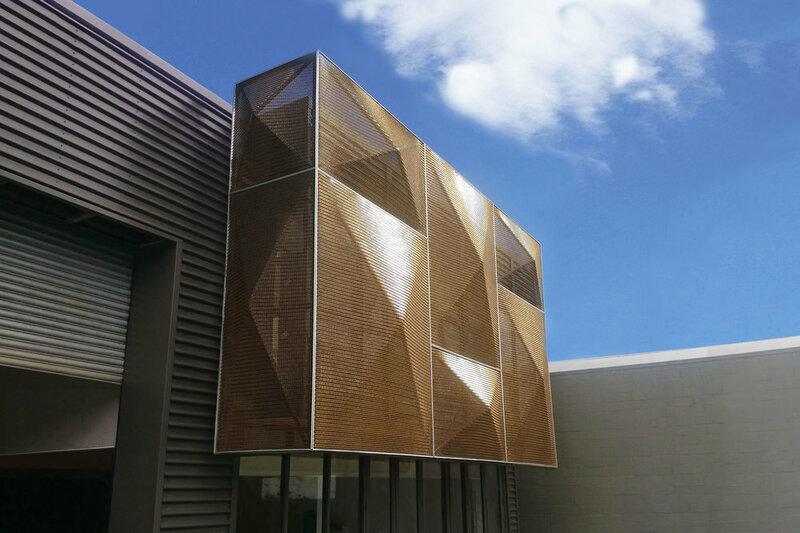 These unique features of Kaynemaile mesh mean designers can be more creative with their facades but know that the functional attributes of the product will be a great selling point to clients and create intrigue for the end user. Please contact us for a free system demonstration or samples. Kaynemaile-Armour significantly reduces both radiant heat through direct sunlight (EMR) and thermal conductive heat from entering the interior of a building by up to 70%. This gives you the ability to let daylight in and manage the passive solar gain—all while maintaining visual transparency. Kaynemaile-Armour is lightweight (3kg per square metre) and goes up fast, cutting down the install time dramatically and saving costs. The fixing systems are simple and don’t need the same level of sub-frame as metal products. This means the installed rate is more cost effective than metal or glass panel products. Kaynemaile-Armour is not limited by panel size—screens can be made to any height or width without joins or distracting gaps. This gives you freedom at the design concept stage that other materials don’t. Making screens to the size you need them means less structure, less fixings, and less time on site. For more information on fire resistance and other benefits of the mesh, visit the Technical page.